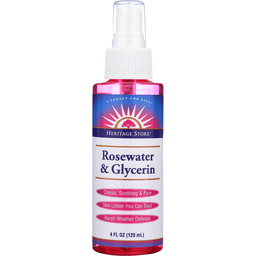 HERITAGE STORE ROSEWATER & GLYCERIN MIST SPRAY HELPS TO ADD MOISTURE TO YOUR SKIN WHILE PROTECTING YOUR SKIN FROM HARSH WEATHER, SUCH AS EXTREME COLD OR HOT CONDITIONS. THIS 4 OZ. MIST SPRAY IS INFUSED WITH ALL-NATURAL INGREDIENTS TO SOOTHE SKIN, AS WELL AS AN INVITING FLORAL SCENT THAT PERMEATES YOUR BODY WITH EACH SPRAY. AURA CACIA NEROLI IN JOJOBA OIL, PRECIOUS ESSENTIALS IS A RICH, FLORAL OIL THAT HAS BENEFICIAL PROPERTIES. THIS READY-TO-USE ESSENTIAL OIL IS MADE FROM THE FLOWERS OF THE PLANT. USED FOR CALMING, THIS ESSENTIAL OIL IS PERFECT IN A TENSION POINTS MASSAGE OIL AND IN A SKIN NOURISHING SERUM. 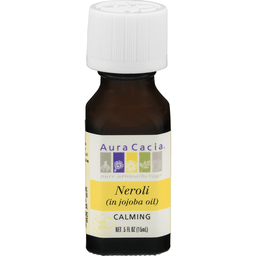 EACH BOTTLE OF AURA CACIA NEROLI IN JOJOBA OIL, PRECIOUS ESSENTIALS CONTAINS 0.5 FL. OZ. OF PRODUCT. SEE LABEL FOR WARNINGS.